We’re truely dedicated to make your travel experience as much simple and fun as possible!We specialise in Expeditions to over 8000m, Peak Climbing, Trekking and Tours in Nepal and to its neighbouring countries. We offer trips from Highland expeditions to lowland tours with an option to tailor made trips that will suit you the best as per your preferences and requirements on any dates that will match your schedule. ''WHY US''...among whole a whole lot of others? Why would you opt to travel with Highland Expeditions? Read what follows below to know why your reasons to travel with US is so much like why YOU decided to choose Nepal as your key holiday destination among a whole host of nations around the planet. We possess a deep passion for alpine adventure & the outdoors, and with the small professional group we have on board, we’ve notched up experience that spans almost 3 decades on some of the most isolated trails and highest peaks. We put a lot of care into all the details when it comes to executing any of your ventures. 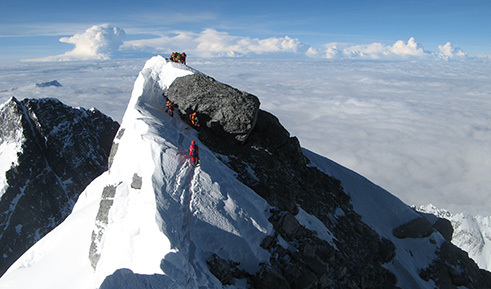 We’ve led expeditions, climbs and treks over the years & summited with success. This was due to grassroots planning with Extensive research, fact-finding and training over the years of our devotion to providing you a holiday with absolute gratification, value for money and never ever compromising on your safety, come what may. This is the whole base of the reasons why we remain one of the leading adventure operators in the country; because we are constantly working to perform in ways that exceed all your expectations the moment your jet hits the tarmac at the airport in Kathmandu. Our safety measures are beyond comparisons, because we’ve seen it all, done it all. We know what the heights can do if you set out unprepared on a high altitude trek or attempt a peak of over 6000m, it’s always a risk above the tree-lines; and we do risk assessments & double check our itineraries before sending it to our guests because we want to make sure enough acclimatizing time is given to potential trekkers & climbers embarking on a trip with us. We use stringent standards which places more focus on planning and risk assessment, this even develops good practice to ensure the safety and well-being of everyone joining a trip to the Himalayas in Nepal. We also make sure our services are paramount and personalized & it’s vital that only the best is provided to our clients because this is mountain business where the risks are pretty high. Our services also include advising our guests on how best to prepare for a trip, especially in isolated regions & when climbing peaks. It’s mandatory for us to encourage our clients to go through a medical routine before starting any potential trip above 4000m in altitude. When you book a trip with Highland Expeditions, you are not just a customer, you are a parent, a brother/sister, a very close friend – put simply – you are family; and all our safety priorities & services are based entirely on this relationship. The planet’s a big enough for everyone to explore and its human nature to checkout the wild outback. But the world is a huge place. And the different languages are mind boggling to learn, with borders to cross and cultures to parley. A limited group of adventure movement makes traveling easier and allows you to make better use of the precious time you have. The logistics don’t become a hurdle to cross; & you can center all your energy on discovering the unknown for the experience of a lifetime. At Highland Expeditions, our groups are limited enough to give you that individual feel of discovering a destination independently, but large enough to get social conveniently. Group sizes tend to differentiate on where and how we’re travelling, but our average group size is about 12 people on the move. Experience has taught us its a great number to let you connect with the folks you meet without feeling like you’re just another member of the group. We’ve put years of know how into our itineraries, operations and accommodation. So why spend hours agonizing over every detail of your unaccompanied voyage when you can leave it to a company who lives and comprehends your style of travel. The smaller group you are the more united you stand & this creates a strong family. We’ve been through it all – the ups and downs have been full and plenty. This is nature at its best & worst. We can’t take anything for granted when it’s a tryst with Mother Nature, especially in the wilderness; and above the tree-lines. Treks and Climbs success ratio have been unparalleled with 100 % of success with more than 90% of the members’ making it to the summit. All our itineraries are drawn up by experts with decades of experience and exploration knowledge, to ensure our travelers will enjoy and capture the most fascinating landscapes with peace of mind during your vacation. Trekking and Climbing gear provided. The Equipment we provide for your Trek includes or is limited to: Duffel bag, Sleeping bag with liner, Down Jacket and t-shirts or a cap. Any other equipment is available on hire in Thamel. We recommend you to trekking outlets that ensure premium quality that don’t give you hang-ups on the trail. The equipment we provide you is of the highest in quality standards to protect you & keep you warm in the wild. The Equipment we provide for Climbing includes a Duffel bag, with well maintained Group climbing gears that guarantee your safety at alpine altitudes. We particularly would like to advise you to consider equipment as essentials while packing for peaks & mountain Expeditions. The list we include on equipment checklist is only a guideline. Adjustments to the list given can be done according to your needs, interests, duration of your trip, or the season of your trip, etc. You can find a lot of these gears to hire or buy in Kathmandu. Much of the gears which are available in Kathmandu are locally manufactured (and consequently a lot cheaper) and some gears found here are imported from China and are obviously of better quality. You can find some prime high quality branded gears too in some famous stores hereabouts. Our prices are based on a costing that has no frills policy. We offer trips at best price and guarantee a value for money. Compared to the services we provide you will find our trip cost to be very reasonable. What you pay in the beginning is the final cost and we do not have any hidden cost. All our deals are upfront, clean and justified. Our in-depth tailored programs have been well thought off to suit your needs. 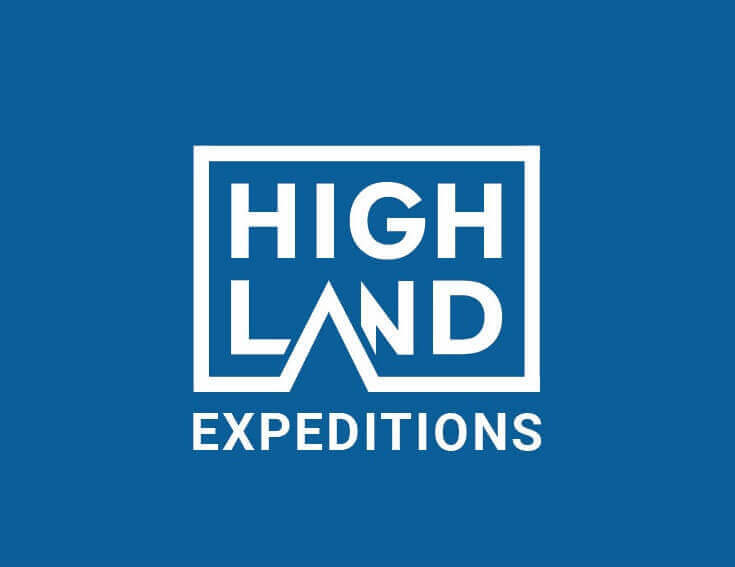 At Highland Expeditions, we use our in-depth experience picked up over the years to organize tours and treks that truly match with your needs. Whether you are looking for a budget tour, luxury tour, or treks & expeditions on the mountains, as a group or individual; we have the expertise to offer you the best & what matches your expectations. This is what matters most, we reckon. All of the trips that we plan for you are not only meant to suit your needs, but also your interests. Our exclusive itineraries are geared to go long or short depending on your time frame & the kind of journey you want to undertake. We combine one program into another to give you a scintillating mix of history, the outdoors & even put a safari into the mix; all precisely worked out to give you much within the short time span you may have. Our website is designed to give you some practical browsing time so that you may be encouraged & develop ideas to assist you work out custom tailor made holidays that enhance your vacations right to the core. The world’s a pretty mind-boggling but wonderful place, and God put his heart into creating this planet; we want to contribute in keeping it that way. All we have to do is just be conscious about the environment, a slightly softer stride. Sustainable travel doesn’t mean we don’t enjoy ourselves. It means that fun can be used to benefit others. With Respect. Highland Expeditions is committed to maintaining our reliability, living by our values and making sure we're running our business with a set platform of principles. This being, to operate in a responsible manner, incorporating the principles of sustainable development in the way we provide our travelers with down-to-earth experiences. However, these values are more than just words in a file on record; they are ingrained in the culture and daily operations of all our ventures; in the city & on the mountains. In addition, we expect our staff and travelers to demonstrate the principles of responsible travel - respecting people, cultures and local environments; in the distribution of wealth; in good will and cross-cultural sharing; and in contributing to sustainable development, where we give back more than we take. It is advisable to consider some factors in the choice of your travel partner prior to the decision to make initial down-payments to confirm the trip of your choice. Highland Expeditions is a premier adventure company based in Nepal and organizes trekking in Nepal with safety priority and service paramount. Join our high altitude expeditions in Himalayas and climb with highly professional guides and best Sherpa support. We offer fully guided and supported expeditions to Everest, Manaslu, Lhotse, Ama Dablam, Cho Oyu and other 8000m mountains. Highland Expeditions has come up with some of the best tours in Nepal that will allow you to get closer perspective of Nepal in short days and in a pleasant way.